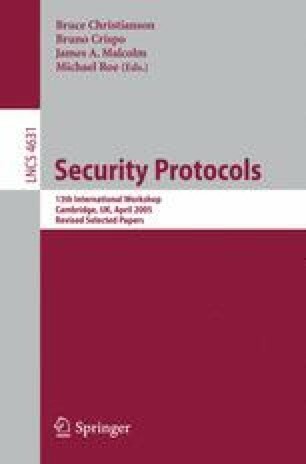 Trust Management [1,4,10] is an approach to constructing and interpreting the trust relationships among public-keys that are used to mediate security-critical actions. Cryptographic credentials are used to specify delegation of authorisation among public keys. Existing trust management schemes are operational in nature, defining security in terms of specific controls such as delegation chains, threshold schemes, and so forth. However, Trust Management approaches tend not to consider whether a particular authorisation policy is well designed in the sense that a principle cannot somehow bypass the intent of a complex series of authorisation delegations via some unexpected circuitous route. In an open system no individual has a complete picture of all the resources and services that are available. Unlike the administrator who ‘sees everything’ in a traditional closed system, the principals of an open system are often ordinary users and are open to confusion and subterfuge when interacting with resources and services. These users may inadvertently delegate un-intended authorisation to recipients. In this paper we introduce the problem of authorisation subterfuge, whereby, in a poorly designed system, delegation chains that are used by principals to prove authorisation may not actually reflect the original intention of all of the participants in the chain.